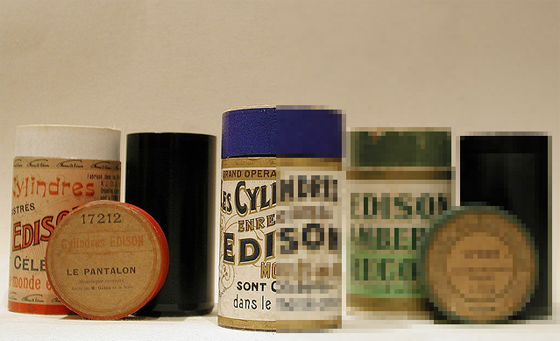 The Assignment: Make something new from antique Edison recordings. In this sixth Junto project, the musicians were provided three public-domain recordings and told they could only use them — and, furthermore, they were to select just one element from each of the tracks and combine them. The audio comes from if not the dawn of recording, then certainly when it was still early morning: the sound is all from Edison cylinders from the end of the 19th century and the beginning of the 20th. The assignment was made late in the day on Thursday, February 9, with 11:59pm on the following Monday, February 13, as the deadline. View a search return for all the entries: disquiet0006-cylinder. As of this writing, there are 58 tracks associated with the tag. The results varied widely, which is not only natural, but the point. For some participants, the sounds of the cylinders were subsumed into a drone haze of their own imagination. In others, the selected sounds were given the spotlight — but even then, variety meant that some musicians focused on the more self-evidently musical material in the original cylinders, while others embraced the rough noises inherent in the ancient technology.